Looking to plan a party in Northern Virginia? 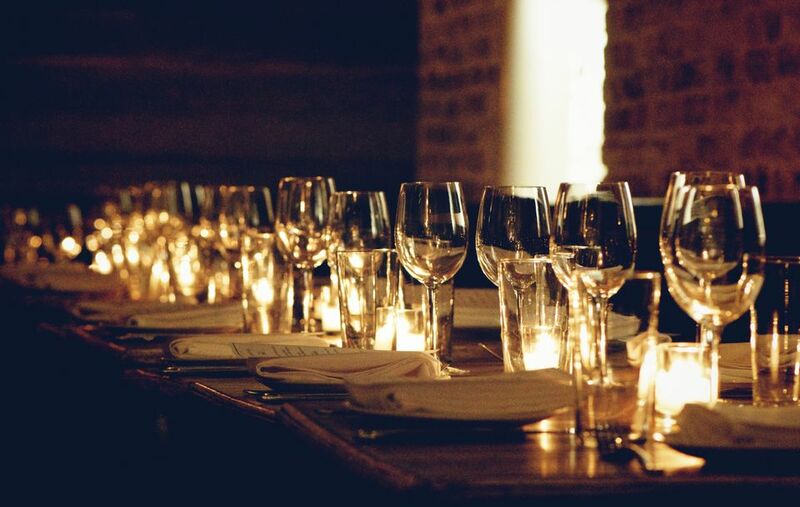 The region's best restaurants offer private dining spaces for holiday parties, business dinners, birthday parties, anniversary parties, and more. Find venues in Alexandria, Arlington, Reston, Fairfax and other destinations near Washington DC. Please note that details are subject to change. Please contact the restaurant to confirm room capacity. The restaurant offers gorgeous views and private dining rooms that can accommodate intimate groups of 8 to large private events of up to 100. The entire restaurant and outdoor patio areas are also available for parties up to 200. Located in the heart of Old Town with indoor space and private outdoor terraces, this restaurant offers an elegant setting to celebrate special occasions. The Liberty Room can accommodate up to 100 guests for a seated event or 125 guests for a reception. The restaurant offers a nice setting for private parties. The Wine Room seats up to 30 people for a sit-down meal. The McLean Room seats up to 15 people for a sit-down meal. The two rooms also combine into one larger space that holds up to 45-50 people. The restaurant offers complimentary AV equipment which includes a 52” flat screen plasma television, an LCD projector, and retractable and portable screens. Free valet parking is available. The restaurant has a prime waterfront location in Old Town and is ideal for hosting private events including business meetings, holiday, & social events. The private dining room overlooks the Potomac River with views of the U.S. Capitol. Located in a cozy luxury hotel in the heart of Old Town Alexandria, the restaurant offers space for up to 26 seated guests or 40 for a reception. The private dining room can seat up to 72 guests and accommodate 125 for a reception. The Parlor, Library, Salon, and Louis XVI rooms can host 10-50 guests. Located one mile from the Mt. Vernon estate right off the George Washington Parkway, the restaurant offers historic charm in its three private dining rooms with views of the Potomac River. Menus can accommodate large and small groups for special celebrations and events. The restaurant offers Irish hospitality and will work with party hosts to accommodate specific needs and budget. The James Joyce bar is ideal for a happy hour or a gathering of up to 38 seated guests or 50 standing guests. The Irish Cottage room features a large stone fireplace and can accommodate up to 60 guests for a sit-down event or up to 120 for a standing reception. The Cottage bar area is available as a cocktail area for up to 35-50 people. The Main bar area is comfortable for up to 50 people. The award-winning tapas bar features a handsome space with easy metro access and ample parking. The Blue Room is a semi-private section for dinners of 20 to 60 guests and can also accommodate a standing cocktail reception of up to 120 people, as it is located near the bar. The Red Room is the semi-private rear dining room with a maximum of 50 seated people. The restaurant, located at Tyson’s Galleria, features eight banquet rooms for private parties such as Bar & Bat Mitzvahs, wedding receptions, and corporate events. The Washington DC area's premier fondue restaurant offers a fun and interacting dining experience - perfect for special occasions. Private dining rooms are available and can accommodate 35-40 seated guests. The full restaurant can be rented for a large party.